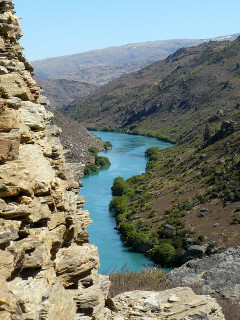 The great Clutha River dominates the Central Otago landscape and runs the length of the Teviot Valley. The Clutha is fed by smaller rivers in the hills and there are opportunities for recreation on many of them. You can enjoy boating and fishing on Lake Roxburgh or Lake Onlsow, fishing on the Clutha or Teviot Rivers, swimming in Pinders Pond or just admiring the scenery as you walk or cycle along the river bank. The Clutha/Mata-au is the second-longest river in New Zealand and the largest in terms of its volume. The Clutha and its tributaries are a mecca for trout and salmon fishermen from around New Zealand and around the world. Trout are in the river all year round and the salmon run in January to March. The fishing is great and access to the river is easy. 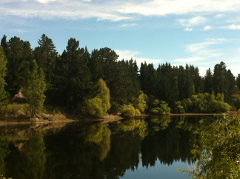 Lake Roxburgh was formed when the Roxburgh Dam was built in the 1950s and has developed into a popular recreation area. There is a slipway for launching boats just across the dam from Lake Roxburgh Village. The fishing is plentiful and there are great places to just drop anchor and relax. 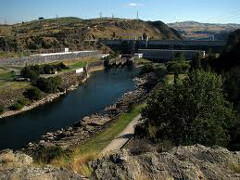 From the Roxburgh Dam you can make your way all the way to Alexandra, about 30km. It is still possible to see the remains of gold miners' huts and tailings as you travel up the river. A relic of mining days, Pinders Pond is a popular swimming and picnic spot through the summer period. Subject only to variations through the Clutha River levels, this safe area is a magnet for families and those who can freedom camp in fully self sufficient vehicles. Lake Onslow was formed to provide storage for irrigation schemes and is now used as storage for the hydro schemes on the Teviot River. 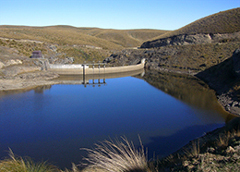 Fishing is popular and access is relatively easy, Lake Onslow is about 22km east of Roxburgh via Roxburgh East.